What’s The Best LED Grow Light for indoor growing? The best LED grow light is the one that satisfies several requirements unique to you, including the size of your grow space and the number of plants you’re growing. Are you using a grow tent or open space? Of course another factor is your budget. So while the answer may not be immediately obvious, these easily answered questions will help you find the best LED grow light for your situation. This Buyer’s guide will help you to find the best full spectrum LED grow lights available on the market from various well-known manufacturers. Regardless of your grow space setup, you should be able to find a grow light that works for you. In addition, there’s our expert opinion on setting up your grow room the right way. Do you have the right LED grow light in your grow room? If you dont, but you’re looking for it, then we’re glad to help you chose the right grow light. As they say, plants crave the best light which can be only provided by sunlight. If you fail to provide the right light for your marijuana plants, then it’ll break your dream of growing cannabis indoors. 2.8 #8. Apollo Horticulture 700W Grow Light – A spectrum that speaks its worth. 3.1 Why Is Best Quality Light Essential For Plants? 3.2 What Are The Different Types of Grow Light Available On The Market? 3.4 How to Choose The Best LED Grow Light For My Grow Space? Now, here’s a quick review of top 15+ Best LED Grow Lights on the market. So, now time comes to review our selected top notch full spectrum LED grow lights available on the market. Why is the Advanced Platinum Series P900 selected as an editor’s choice? The Advanced Platinum P900 has tons of reasons to be recognized. Let’s discuss all the reasons behind its selection as an editor’s choice in detail. Advanced Platinum P900 Full Spectrum LED Grow Light is a product from PlatinumLEDs which itself is a well-known name on the market for its quality and commitment towards customer satisfaction. 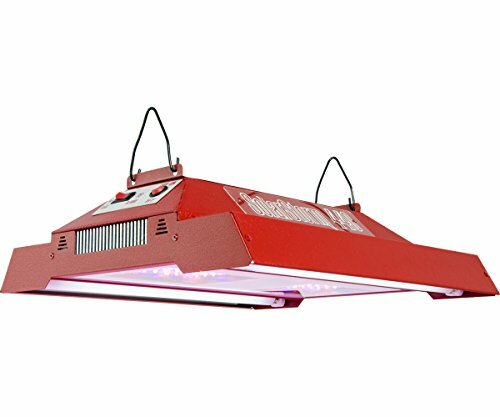 If you want to go all in with this grow light for your next grow then it’s the best option which will provide you a beautiful cannabis harvest in return. To understand better, let’s explain all of the P900’s features in depth. Advanced Platinum P900 is built to provide your cannabis plants with a complete full spectrum of light. Its spectrum ranges between the 12 most essential bands of light for any living plant – from infrared to ultraviolet. In other words, full spectrum light means the bands of light emitted is the same or very close to natural sunlight. That means it’s okay to use the Advanced Platinum Series P900 LED grow light from your cannabis plants’ seedling to flowering phase. That’s the whole lifecycle of your cannabis plant. Providing full spectrum light for your plants means heavy and resinous buds at harvest. Yeah, one of the reasons this grow light is famous among weed cultivators is its PAR abilities. Before we explain this feature in depth let me throw some light on the term PAR. PAR is an abbreviation used for Photosynthetically Active Radiation. In other words, PAR is the number of photons within the visible spectrum of light falling over a square meter area in 1 second of time. PAR results that are tested publicly by PlatinumLED for its 900W variant was around 1615 from the height of 18” and 1250 from the height of 24”. These sort of results are extraordinary and can be produced by Advanced Platinum LEDs only. You don’t believe me right? You may take any grow light available on the market and compare its PAR results with this beast. At the time of writing, none can beat this power pack product by PlatinumLED. Advanced Platinum P900 LED Grow Light is equipped with auto switching 110v/220v LED Drivers. These drivers are the reason behind its ability to provide you better output and consume less electricity. You’ll be amazed by its ability to automatically sense voltage. It saves your grow panel from any short circuit and keeps your grow room safe from overheating hazard. These drivers can handle any global voltage input. Efficient design with these drivers is proof of it being most efficient grow light on the market. A power-packing performance from a LED grow light is only possible with the right choice of LED chips on its board. Advanced Platinum P900 LED Grow Light is equipped with top quality LEDs from bridgelux and CREE. These are the only companies which deliver satisfaction to its end users. Yeah, these LEDs are the most efficient, reliable and durable. It makes Platinum grow lights a best LED grow light for the money. In total 300 LED Chips of 3W each is equipped on the Advanced Platinum Series P900 Grow Light board. As this grow panel is made with high-quality materials and LEDs, it ensures better coverage than any other grow light available on the market. During vegetation or as a seedling, this grow light can cover 6’ x 4’ of area from the height of 18” with ease. However, due to the need of remarkably intense light during flowering, this coverage area will be reduced, and it can cover around 5’ X 3.5’ of coverage space from the same height. In case you have comparatively smaller coverage space, you may want to consider the Advanced Platinum LED P600 Grow Light from this well known brand. This grow light comes with vegetation and bloom switches, so that you can balance light intensity in your grow room according to your plant’s life cycle. You may switch your AdvancedLED Series P900 to bloom mode as soon as your marijuana plants start flowering, and enjoy bigger and better flowers during harvest. However, you always need regular observation and monitoring to avoid any harm to your plants. Advanced Platinum Series Grow Lights are known for their durability and strength as well. When you bring this panel into your home, you’ll notice premium quality material on its body. The design is remarkably sturdy and can last in your grow room for extended use. Not only outer body material but inner parts are also manufactured by either PlatinumLEDs or by another reputable manufacturer on the market. This grow light comes with a lifespan of around 8-10 years, which is fabulous, isn’t it? The Advanced Platinum P900 is packed with quality drivers as we mentioned earlier, and can perform very well with them. This 900W Grow Light by PlatinumLED can provide you highly efficient light output at an average power draw of just 280W-560W. It utilizes less power during vegetation. Moreover, power draw is doubled during flowering as your plants will be hungry for intense light during the flowering phase. 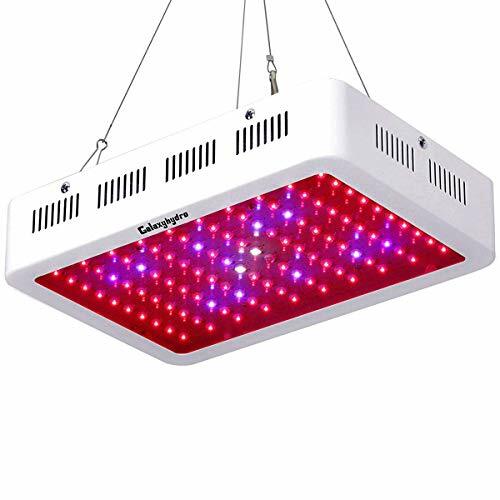 Once you get this grow light in your grow room you should be worry free for 5 whole years. This full spectrum LED Grow light isn’t just meant to provide efficient light to your marijuana plants, but it is also committed to customer satisfaction. If any failure happens the manufacturer will cover all the shipping, and they’re also committed to doing anything for minimizing your downtime. Wow! Now, Take a look at its advantages and disadvantages in a brief. If Seen With Naked Eye, it may harm your vision. We’ve written each word on this article based on thorough research and conversation with existing users. Some of the existing users with whom we had a few words have recommended it to us based on their previous experience and test results with advanced platinum grow lights. If you take a look on Advanced Platinum Series P900 LED Grow Light’s fame on amazon then also you’ll realize that advanced platinum grow light is the first choice of the majority of professional cultivators due to its ability to perform inside their grow room. We noticed that 8 out of 10 existing users are recommending this product to beginners as well as to professional cultivators. We can’t help but notice the reviews mention phrases like “worth the money” and “love this light.” Combine the reviews with feautres and we believe the AdvancedLED Platinum Series P900 is simply one of the best LED grow lights. 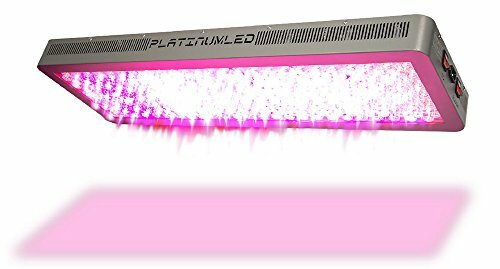 If you’re waiting for our opinion then looking at its reviews on Amazon and various growing communities we’d surely recommend to Check out the Advanced Platinum P900 LED Grow Light before making any other decision. Excellent spectrum abilities along with dual mode switching comfort and auto voltage sensing drivers make this beast a powerful option. If you’re planning to replace your traditional HPS system of 1000W and budget isn’t an issue, buying this product will be a simple choice and a great investment. However, if you feel short on budget, it’s good to start with something small and with a reasonable price tag. Don’t worry! Keep reading because we’ve got something for you as well. Winning High Times Magazine’s “Stash Award 2014”, “Best LED Light of the Year 2016” & “Best New LED Grow Light Of 2017” isn’t easy. Right? This G8 LED 900 watt grow light was awarded multiple times with a High Times Magazine award for its remarkable performance and contributions towards the hydroponic and indoor growing community. Moreover, it may win 2019 with its performance and abilities as well. The G8 is a brand known for quality and performance. Also, achievements by this manufacturer speak for itself. G8LED Mega 900W LED grow light performs well with the help of 8 bands full spectrum light output to your plants. It comes with ultraviolet and infrared as well. The intensity of this light can easily replace your old-fashioned HPS or MH system of 1400W. We know this HPS equivalence is nothing more than a crappy digit listed by the manufacturer but there’s still a segment of people believing that it matters when it comes to grow lights. So, we discuss it a bit. All this is possible after the hard work of 8 years of research by the manufacturer G8LED. G8LED utilizes quality US made LED chips on its board, and after assembly, it’s tested in the US as well. So you’re not going to get a cheap LED Grow Light by some low quality manufacturer. Instead Of talking about it generally, let’s understand each of the G8 LED 900 watt grow light’s features in depth. Here is list of features available in the 900 watt G8LED. This grow light panel from G8LED is performing inside many of existing cultivators grow space since last eight years. During these 8 years they’ve upgraded this product to an extreme level. Today what you’ll be purchasing is a complete masterpiece built after various iterations in a long 8 year journey. G8LEDs are made to perform great and to provide the best possible spectrum output to your cannabis plants. This LED Grow light is built to give you a complete full spectrum output with the help of the 8 most efficient bands for any green plant. Apart from these essential 8 bands, The G8 900w mega LED grow light also delivers UV and IR spectrum to your plants which ensures better growth and safety of your plants. Wavelength ratio by G8LED 900W grow panel will be balanced for both the phases of your plant’s life cycle. G8LED does not provide double mode switching like other manufacturers. However, they’ve designed their product this way intentionally so that it don’t stay underutilized by keeping few LEDs of during vegetation. The manufacturer suggests to add extra Bloom Booster LED Grow Light of 90W which are manufactured by G8LED themselves and designed specifically for blooming of marijuana plants. During vegetation, this grow panel will spread more of blue light which will enable your plants to get better health and grow well. Moreover, during flowering, you may switch on both bloom boosters and help your marijuana plants produce the best quality of buds for you. Red spectrum provides more efficient and intense light to your plants which is generally required during flowering. This helps make flowers more healthy, resinous and more substantial in weight. All in all, this grow panel will perform up to the mark during the entire life cycle of your marijuana plants, and hence it’s known as one of the Best LED grow lights for cannabis plants, providing highest yield at harvest time. 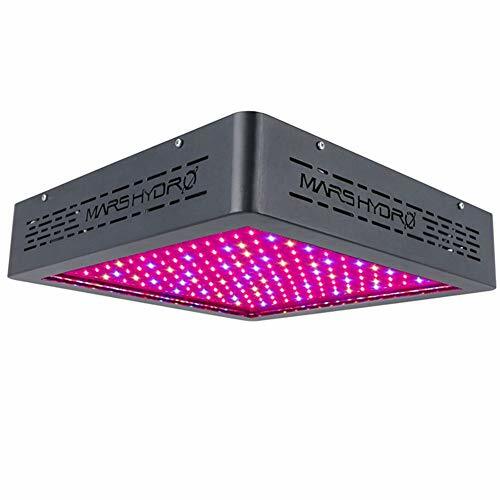 With the help of remarkably intense brightness and the high-quality US made LED chips this grow light by G8LED 900W LED Grow Light can cover an area of 6’ x 4’ during any of the phase of your plants with ease. It won’t reduce coverage space during flowering because of its ability to produce more intense light during flowering. With this much coverage, you can quickly grow 8-10 cannabis plants inside your grow tent. With this large average coverage area, the G8 900 watt grow light deserves high recognition for sure. G8LED 900w full spectrum LED Grow Light is made with the highest quality materials for outer body. On the other hand, its inner compartment equipped with high-quality epistar or bridgelux LED chips which are made in the USA. When the G8LED 900W model is performing at its best, it only utilizes 540W of electricity. Yeah, it can replace a 1200W to 1400W MH system from the light intensity point of view. This grow light is versatile in use and can be operated with the help of 110V-240V input. 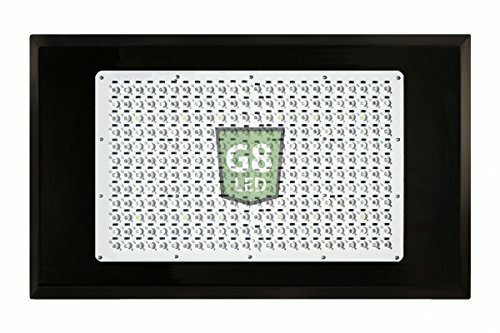 If you’re ordering the G8 900 watt, one of the best LED grow lights from amazon, then depending upon your shipping location they’ll provide your power cord for your grow panel. Here comes the safety of your plants which is the first thing you should consider before making your decision. The G8LED 900 watt variant comes with multiple cooling fans, and advanced aluminum heat sinks keep the environment inside your grow tent as cool as possible. G8LED grow lights come with the extended support of 2 years in case of a breakdown, which will happen rarely. You know you won’t need to file a claim for it just by looking at its build and power pack performance abilities. Looking at all these features we could count this Panel as one of the best LED Grow light for medical marijuana cultivation. Heat Dissipation :- Marvellous Cooling With Fans and Heat Sink. Now, take a look at the G8 900 watt benefits and drawbacks in brief. A bit larger in size. An included timer could have been an added advantage. If we consider the opinion of current cultivators utilizing G8LED 900W inside their grow space, then they’re recommending it based on the fact that it’s a value product. The manufacturer has labeled this product with a precise price tag for the features it offers. Yeah, 10 out of 10 people are recommending this product if budget isn’t an issue, and if a buyer wants to invest their money instead of spending it on a grow light. You may bring it home if the budget does not bind you. There are other grow lights available as cheap options but we recommend to buy G8LED 900W considering its ability to provide higher yield per watt of electricity. It’s an ultimate money saver in the longer run and will cut your cost on your electricity bill. Now, it’s up to you whether you want to go with it or not. Yeah, 440 watt variant in the solarstorm series by California lightworks performs extraordinarily inside many cultivators' grow tents. Solid build with high-quality material enables it to provide the essential benefits concerning light to your plants and regarding lifespan. 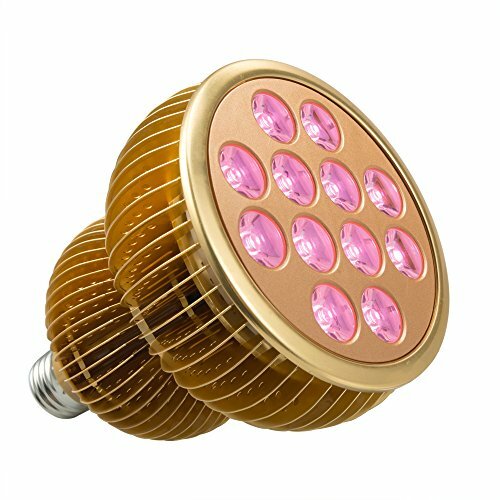 This grow light is equipped with 88 LED chips of 5W each, and along with LEDs it also features 2 UV-B T8 panels of 15W for more intensity during flowering. Solarstorm 440W LED Grow Light delivers a spectrum of 6 bands which penetrates through your plant's canopy with ease. Its metallic body with aluminum sheet metal material makes it more durable. The focal point of its optical glass will be 90 degrees which will deliver direct light over the canopy and avoid waste of light. The California Lightworks Solarstorm 400w LED grow light only has one focusing angle of the glass cover, and they’ve avoided secondary glass for a reason. It’ll help you to save cost on the electricity bill. To be accurate, Solarstorm 440W will utilize power according to its mode of operation. Yeah, during vegetation this grow panel will draw on an average 235 watts. On the other hand, it’ll draw 320 watts during blooming. However, if you’re utilizing UV-B panel as well during bloom, then it’ll pull 350W from the wall. With this low power draw, it can still replace a 600W MH or HPS light system in your grow space. Its flux output enables your plant to sustain the best possible growth. With this, you’ll notice more large flowers obtained under the effect of this grow light compared to other cheap LED panels. For easy switching between vegetation and flowering, they’ve provided a dual mode switch as well. It makes things easy for you. Isn’t it? Now, if you’re more concerned about the temperature inside your grow tent, then we’re glad to inform you that we’ve interviewed several people who are using this panel and a majority of people have not reported any issue. The California Lightworks Solarstorm 440W LED Grow Light operates in a hazard-free manner with the help of scientific design and multiple cooling fans. All these features come to you at an affordable rate along with three years customer satisfaction commitment from California Lightworks. Take a look at the below mentioned specs. Lifespan :- 80000 Hours if Used on average 16 Hours A Day At Max. Take a look at the benefits and drawbacks. Best In Segment Performance In Terms of Yield. High Quality Build With Powder Coated Aluminium sheet. Waterproof build would have been an added advantage. Do People Recommend It To Others? If this question is in your mind, then don’t worry like the majority of existing cultivators who are active in the various marijuana growing forums and indoor gardening communities. They’re all praising the California Lightworks Solarstorm 440w LED grow light based on the results they’ve obtained using this panel. One of the users who’s using this variant for more than one year has reported that he’s taken 2 harvests using this panel – both with incredible results. Moreover, he also confirmed that yield obtained by this light was higher than the return by his previous Cheap LED Grow Light of 600W. What would we recommend in the case of California Lightworks Solarstorm 440w? No matter if you’re an amateur cultivator who is just starting into growing business or a professional who is in it for many years, this product can do wonders in your grow space. Looking at its bright light, UV-B enabled mode, and silent operation with steady temperature, we’d surely recommend you to Buy Solarstorm LED Grow Light for better results. Just want to start growing and don’t want to spend much on a grow panel? Mars Hydro is widely known as a budget friendly grow light manufacturer. Mars Hydro manufactures products which are highly reliable. Over time they’ve launched many products on the market, but the reflector series is one of their famous grow light series among professional weed cultivators. Though there is a wide range of sizes available in the reflector series, we’re reviewing 900W variant of Mars Hydro for those who want to start with a larger grow space. So, without wasting more time, let’s take an in-depth look into this panel. Marshydro 960W is built using reliable and highly durable epistar LEDs of 5W. This grow light is also known as Mars Hydro Reflector 192 because of the number of LEDs equipped on its board. Yeah, it is equipped with 192 LEDs of 5W each. 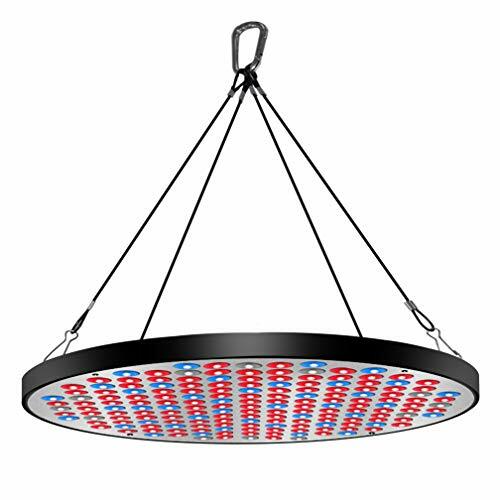 Mars Hydro Reflector 900w grows light comes in the dimensions of 22” x 21” 5” and can cover an average grow space of 4’ x 4’ during veg and 3.5’ x 3.5’ during bloom with ease. Large mirror-like reflectors are the reason behind more intense and extremely bright light on your plant’s canopy. And it's observed in many scientific studies that an intense light produces more bulkier and healthier flowers. Marshydro 900w comes with dual mode switching ability which gives you the freedom to operate it throughout your cannabis plant’s lifecycle. As far as PAR or PPFD values are concerned, we took opinions of people who're using the MarsHydro 900 watt reflector series, and they reported that from 18" height it measured values that were around 1200 uMol. If we talk about light quality, then it's equivalent to a 1200-1300W of HPS or MH system. However, it only draws 400W from your electric outlet during full load. Heat dissipation by this grow light is up to the mark and keeps your grow space with a balanced temperature. The MarsHydro 900 watt is equipped with multiple cooling fans along with pincushion heat sink. This also helps extends its lifespan. It's not just one of the best cheap LED grow lights on the market, Mars Hydro 900w is one of the best LED grow lights available in the budget bound grow light segment. Along with all these superior abilities at very affordable rate mars hydro is offering 3 years of consumer support for a better, worry free grow light experience. A brief overview of its pros and cons. Impressive Customer Support Of 3 Years. What's the Buzz about it in the Cultivator Community? 9 out of 10 professionals who’ve either used it in the past or are using it currently are recommending this grow light to beginners. Not just because it’s budget friendly, but because it can provide remarkable results after each harvest. Waiting for us to finish? 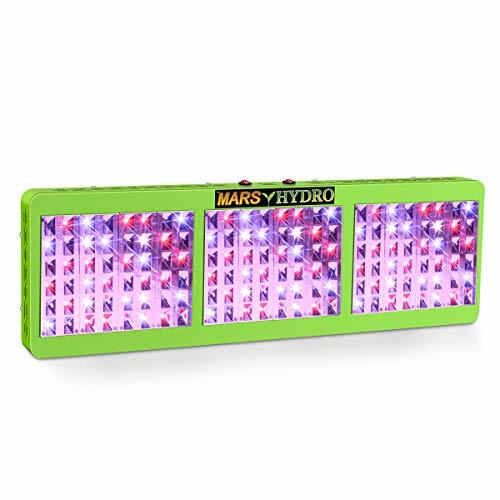 Then, check the price of Mars Hydro 900W LED Grow Light if you’ve got a tight budget and wanted to start with comparatively larger cover area. It’s definitely a one of the best cheap grow lights for anyone falling in that criteria. Its reflector will help you to spread more light over your plant canopy, and you’ll be able to take yield from more number of plants. For smaller coverage and a an extremely beginner grower Mars Hydro 300W will be a perfect fit. Another reason we’re recommending this grow light to you is enormous consumer response we noticed for it on various communities and on Amazon as well. Looking for one of the best LED Grow lights for marijuana cultivation indoor? Then here comes our second choice for more massive grow space and limited budget. To stay in the heart of customers you have to perform consistently. Moreover, that’s what Viparspectra has been doing for ages. The Viparspectra V1200 LED grow light is a grow light designed for covering a remarkably large grow area with your limited budget. To get the better overview of the Viparspectra V1200 full spectrum grow light let’s dive deep into its features and specification. The reason behind its success on the market seems to be its ability to generate an optimal full spectrum for green plants like marijuana. Also, for generating a complete spectrum, it makes use of massive 240 Epistar, Or Bridgelux LED chips of 5W each. The whole panel is scientifically designed for keeping growth and health of hydroponic and indoor plants in mind. So it seems like canopy safety was kept in mind while creating this incredible LED grow light. It covers a vast grow space of around 4.5’ X 4.5’ during vegetation and 3.5’ X 3.5’ during bloom from the recommended height of 32” and 24” respectively. Even with that coverage it can deliver remarkable light quality. With marvelous PAR and lumens reading this light can replace a 1000W HPS or MH system like a boss. In addition it won’t draw much power from your wall. It’s 524W as per their specification. Isn’t that great? To keep your grow room balanced in terms of temperature it makes excellent use of multiple cooling fans along with an advanced heat sink. With all this, Viparspectra 1200W LED Grow Light comes at a fair price and gives you satisfactory results regarding yield. Three years of local warranty along with 30 days money back policy is a great bonus. Professional’s Most Recommended Light To Beginners. Double And Separate Mode For Veg And Bloom. Local Manufacturer’s Warranty Of 3 Years. 30 Days Money Back Policy. Needs safety glass to prevent harm to human vision. 9 out of 10 people who have worked with the viparspectra or are currently using its products are recommending it to everyone. “It is one of the best LED Grow lights available on the market” that’s what most of the cultivators reported upon asking. With 100+ reviews and ratings on Amazon, this product surely deserves your attention. And, that’s why we also included this model in our review of Best LED Light for 4X4 Grow Tent as well. Don’t want to compromise in your grow space, even with your tight budget? Then just check Viparspectra V1200 LED Grow Light’s capabilities and you’ll realize that it’s a product which will provide a fantastic experience for you and your cannabis plants. With marvelous spectral abilities and performance reviews from professionals, it surely deserves a place in your grow space. Do you wonder why we're placing a second grow light from the same manufacturer in this article? This is the best LED grow light reviews and buyer’s guide. We're obligated to shout out all the best LED grow lights, regardless of who makes them. With that said, massive consumer response and excellent on the field performance makes it a highly demanded to grow light in the indoor cannabis growing community. How can we neglect this grow light when it’s performing like some unstoppable yield generator? Excellent full spectrum along with dual mode switching makes it an excellent light for all-around results. Most important of all, from the height of 18” from canopies it’ll provide around 873 uMol PAR readings with ease. The Mars Hydro 720W's spectrum is very close to real sunlight, and hence we shall admit it here that Mars Hydro has succeeded in mimicking natural sunlight. Reflective blades make the light more bright and intense, and can easily replace a traditional HPS/MH system of 960 watts. 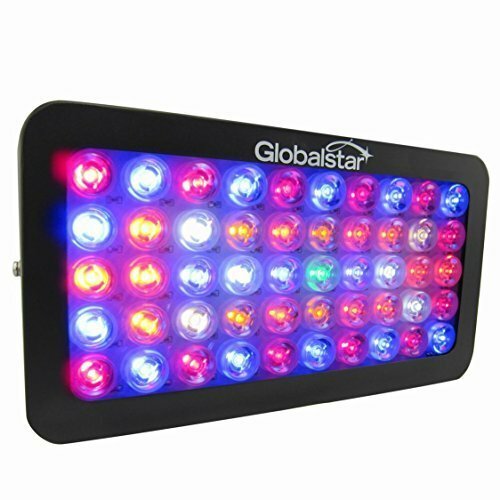 This grow light is equipped with 144 epistar LEDs of 5W each. Entire body and panel is designed scientifically and can cover a massive area of 2.5’ X 4.5’ and 2’ X 4’ during vegetation and bloom respectively. Even though it is delivering you a 900W HPS equivalent light, it only consumes 298W from your wall outlet. Daisy chaining ability gives you the freedom to expand your growing space without any additional socket in your wall outlet. If you’re concerned about temperature and atmosphere inside the grow tent, then it’s not a matter of concern here because Mars Hydro 720W grow light is equipped with multiple cooling fans and high-quality aluminum pin cushion heat sink. This keeps the temperature of grow space very well balanced and stays cool itself. With a reasonable cost, Mars Hydro is providing 3 Years Warranty and 30 day money-back guarantee. Highly Recommended Grow Light For Beginners. A timer would have been an added advantage. Due to reflectors, safety glass is required to look at it while it’s functioning. What do they say about Mars Hydro 720W? “Over the years they’ve improvised their products and today what we’re seeing is a complete masterpiece by Mars Hydro.” That’s what Jonathan (a good friend of mine) said when I asked about his opinion. You can count on 9 out of 10 people recommending it to you based on their experience with this grow panel. What do we say for Mars Hydro 720W? Want everlasting results at an affordable price? Go with it. We’ll recommend Mars Hydro 720W Reflector Series Grow Light because we’ve seen its beauty. Works like a charm in ones grow tent and yields are impressive, to be honest. Grow with it without any doubt. Bestva never failed in providing a real value product and it makes sense to count it as one of the best LED grow lights for your weed growing adventure. This can be seen in this DC Series grow light. This full spectrum LED grow light from bestva produces a complete spectrum that delivers highly efficient and absorbable luminous energy for your cannabis plant. Utilization of state of the art technology in its build makes it a perfect product for your grow tent. Instead of using 5W or 3W LEDs on the panel Bestva used 200 Dual chip LEDs of 10W each and succeeded in delivering the highest PAR output per LED. From the height of 18” it’ll produce 760 uMol PAR and from 24” it’ll help you in achieving around 676 uMol PAR readings. Not bad. With useful spectral output, Bestva DC2000W can easily cover around 7.8’ x 7.5’ of coverage area from the height of 24” as manufacturer claims. However, people who’ve installed it in their grow space have reported an average coverage of 5.5’ X 6’ to 6’ X 6’ with ease from the 24” of height. You may set it according to your needs. Though the panel doesn’t come with dual mode, you can still rely on this grow panel for your entire grow as it provides uniform coverage and light suitable for your entire grow. From seedling to harvest this grow light is a proven great companion for your marijuana plants. Blue to Red spectrum ratio is well balanced in this panel which eliminates the requirement of dual mode operation. If you’re bothered about power consumption then, this grow light undoubtedly saves your bucks in electricity bills. It only draws 390W for its operation, and still its light quality can easily replace an HPS/MH system of 1400W. The dominant cooling system is implemented with the help of multiple cooling fans and aluminum heat sinks. Heat dissipation in Bestva DC 2000W is excellent. However, fans seem to be a bit noisy in more extended run. You are getting all these perks along with 3 years of warranty and 30 days satisfaction or return guaranty from Bestva. Not Waterproof, have to keep it away from dripping water. What do professionals say about the BESTVA DC 2000W LED grow light? According to experts and experienced growers, this is the one of the best LED grow light to start with. 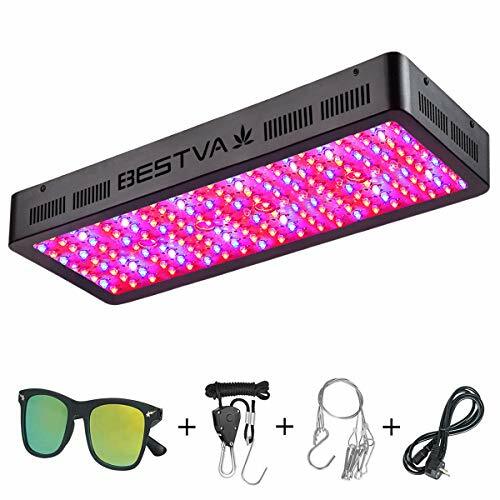 Upon asking the reason for their opinion, most of them said that going the Bestva LED grow light was good choice because it is labeled nicely, the manufacturer has a good reputation, and Bestva LED grow lights have great durability. 9 out of 10 existing users will recommend this product from BESTVA. What do we say for BESTVA DC 2000W? If you don’t want to make a hole in your pocket and still want to get something nice, then looking at the quality of brightness, spectrum, build, cooling abilities, theBestva DC 2000W LED Grow Light is not a bad product at all. Yeah, few features like daisy chaining and dual mode could make things easy for you. Still, if the price is a concern and don’t want compromise in coverage, then go with it otherwise Viparspectra and Morsen both are excellent choices compared to this. #8. Apollo Horticulture 700W Grow Light – A spectrum that speaks its worth. Why opt for a cheap LED grow light, When you can get high quality and potentially worthy LED grow light for your plants at a fair price? Apollo Horticulture is a well-known name in the horticulture industry for its premium quality. They understand it very well that highly effective light is must for any plant to grow well and yield good results. 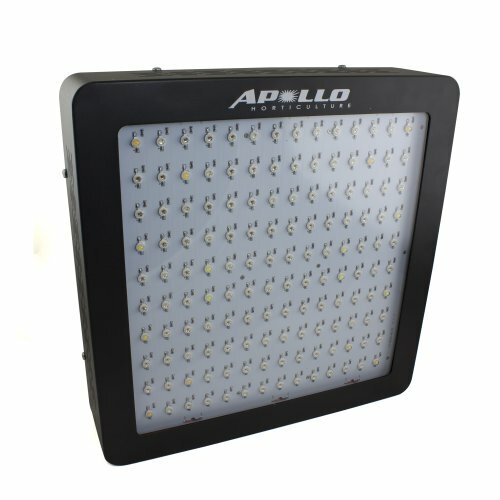 Horticulture 700W LED grow light by Apollo comes in handy, and it is straightforward to install and use. This light can cover around 4’ X 4’ of grow space uniformly. Though light doesn’t come with any additional feature like dual-mode switching, timer or daisy chaining, it does come with exceptional quality and highly dependable brightness for your plants. According to marijuana cultivators who are utilizing this grow light, its average power consumption is settled around 360W. People love it because it doesn’t need a ballast to be operational, and it produces considerably less heat. It's safe to keep this grow light near the canopy due to its cooling abilities which avoids harming your plants. Apollo grow light comes with remarkable 50,000 hours of lifespan. Isn’t it comforting to know that you have a light panel which is effective for your plants and less heavy on your wallet? Let's check the pros & cons. No daisy chaining, timer or dual mode. Waterproof design would also be an added advantage if provided. Don’t have large coverage expectations? Do you want your pocket to be safe from a huge hole? Then, go with it. Spectrum is remarkable as per the majority of cultivators opinion. Ideal for growing 2 – 3 marijuana plants. People are saying this grow panel is one of the best LED Grow lights they’ve ever used. Apollo being a reliable brand offers an excellent quality product suitable to the majority of the beginners for a quick start. Check Apollo 600W’s price here and you’ll agree with my words. If you’re just getting into cannabis growing, then we recommend you to go with this sort of fair priced grow panel. So that, once you get familiar with increasing, you can easily replace the panel in a bit larger price segment. In case you want to buy a 700W LED grow light but don’t want to go with Apollo, then you may want to read our dedicated review article on Best 600W LED Grow Lights. You’ll surely be able to find the right brand for you. Here's another winning product in our best LED grow light reviews and buyer guide. 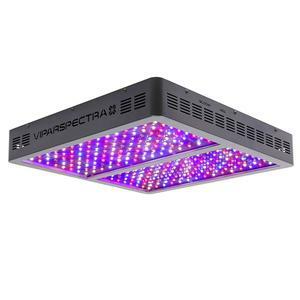 It's the Viparspectra Reflector V600 LED grow light. Maybe you don't need the beastly V1200 we reviewed earlier. That's fine because the V600 is the younger sibling with a mean bite. 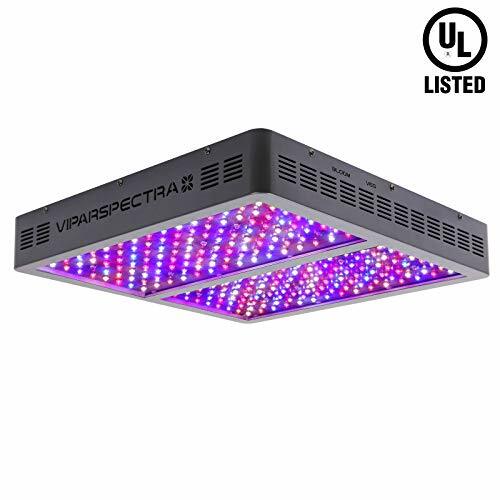 Unbeatable and unstoppable performance from viparspectra V600 is the sole reason behind this grow light being in this list of best grow lights for marijuana. Enough drooling and on to the features! V600 is a grow panel which is scientifically designed to deliver highly balanced and efficient light to the plant canopy. 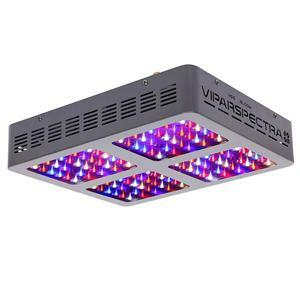 Viparspectra V600 Grow Light is equipped with 120 5W diodes and reflectors which produces a well balanced and a complete spectrum for any green plant. Along with the most efficient full spectrum rays, this panel is capable of delivering infrared (IR) as well, to produce more resin on your flowers during blooming. As far as PAR is concerned, it's 456 uMol from 24" height. I do agree that it's comparatively lower than some of the alternatives available on the market. However, light effect and efficiency is right up to the mark. The Viparspectra reflector V600 comes with dual mode ability and makes things easier for you and your buds while moving from one phase of growing to another. Efficiency and brightness can easily replace a traditional 600W lightning system, and still, it won’t increase your recurring cost as it only draws 269W from the wall. With all this ability Viparspectra V600 can cover an area of 3’ X 3’ during veg and 2.5’ X 2.5’ during flowering. It's perfect for individuals who only plan to tend a small grow. However, it’s always up to you to change it according to your plant type and previous experiences. If you still want more coverage, then this grow panel is daisy-chainable hence you can expand your grow space at any time as per your need. High tech and advanced heat sink with quietly running cooling fans make your grow space a beautiful and comfortable home for your plants. 3 years manufacturer’s warranty is a real cherry on top. We looked around at some of the V600’s reviews. Aside from the 4.5/5 star rating, some of the most popular phrases were “bang for your buck,” “runs cool,” “well built,” and “super bright.” How can you argue with that? 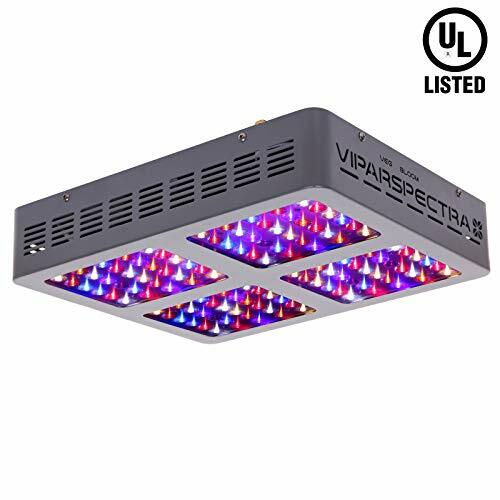 Reliability and efficiency make this grow light a real masterpiece by viparspectra, and hence the majority of experienced cultivators are recommending it to everyone. If you don’t want to spend much initially and wants to start with less number of plants then going with it would be your best bet. While recommending Viparspectra V600 to you, we concern reliability, ease of use and quality of light which matters a lot. The Meizhi Reflector 450w will bring satisfaction to you and your cannabis plants. MEIZHI is widely known and talked about brand in the grow equipment industry. This manufacturer spends more time on quality instead of quantity, and it can be seen in its products. User safety, well-grown plants, and customer service is MEIZHI’s identity. In this variant of meizhiyou’ll experience the complete use of produced light because reflector design prevents all the light loss. 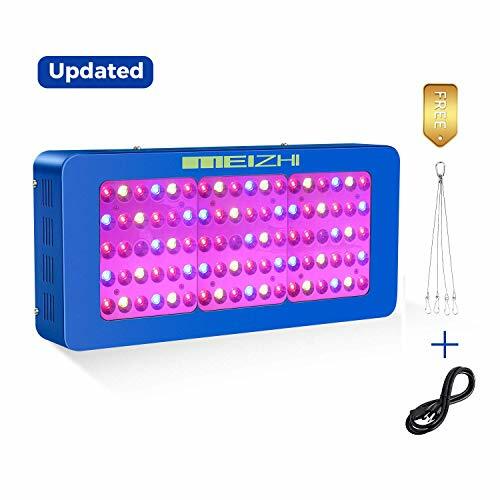 Meizhi 450W supplies concentrated and direct light on your plants so they can grow bigger and healthier and to produce a massive yield for you. The Meizhi 450w is a full spectrum light which can replace an old-fashioned HPS system of 450W and still only consumes around 195 ±10% of wattage from the wall. It’ll provide massive 779 uMol PAR from the height of 18” which is impressive for a grow light in this range. This grow panel is a perfect fit for your 2’ X 3.5’ grow space or grow tent. Being easy to install you have to hang it over your plant’s canopy and start experiencing its magic. It’s not just easy to install, but it’s also easy to use because the Meizhi Reflector 450W Grow Light comes with a dual mode which makes it convenient to operate during various phases of the cannabis' life cycle. State of the art technology and high-quality aluminum heat sink with cooling fans ensures the safety of your plants and the cold temperature of your grow room. The product comes with 1 year of local warranty along with 30 days return policy. Some say this light is better for flower phase specifically. MEIZHI is an established manufacturer in the growing community. 450W is also one of these products from meizhi, and that’s why you’ll notice the majority of existing users recommending it to fellow newcomers in the growing business even though it is coming with the very limited warranty period. Upon asking the opinion of 10 people, I’ve got eight yes for Meizhi while 2 of them avoided recommending it just because of its limited local support. Regardless, this product is solid all around, and it’s worthy of a recommendation on our site. A quick reminder that the Meizhi LED grow light, like most of the grow lights I recommend here, is available in different wattage. So even if I review the 450w model, you can easily select a different wattage for your exact cannabis growing needs. The Meizhi happens to be available from 300w to 1200w. Beginner? Alternatively, want to grow in limited space for your next grow? Anyway, in both the cases Meizhi 450W is the product to be considered in the list along with viparspectra and Marshydro. Being an efficient product, it deserves your attention at least once. Giving it a try won’t be a bad move at all. That’s what we think. However, you have got a bunch of other choices in the 450W grow light segment if you want to avoid it due to its small warranty period. Believe in more advanced technology? Congratulations! We’ve found a perfect match just for you. This manufacturer’s belief is utmost similar to yours, and that’s why they’ve opted for 10W dual mode LEDs instead of traditional 5W or 3W. The light produced by this grow panel has a quality similar to any state of the art COB LED Grow light. King plus 1000W LED grow light is scientifically designed and keeps things balanced like PAR, the growth of plants and coverage. The panel is designed using 100 LED chips of 10W each and generates massively bright light for green hydroponic plants. Though a dual-mode ability is not provided with this grow panel, it can provide uniform coverage throughout entire grow cycle to your plants. It can cover around 3.4’ X 3.8’ from a recommended distance of 24” above the canopy. This grow light produces a complete full spectrum including blue, red, yellow, and white bands. Along with IR and UV abilities, it becomes a complete caretaker for your plants. King Plus 1000 Watt Grow light is ideal for complete grow of your marijuana plants. Moreover, you don’t have to worry about anything once you install it in your grow tent. Two cooling fans with heat sink keeps a watch on the temperature inside your grow tent. Upon 14-16 hours of operational use, we didn’t observe any high-frequency temperature inside our grow tent. Guaranteed customer satisfaction for a massive 3 years is a bonus from king plus. A timer would have been an added advantage at this cost. An inferior product doesn’t get such a response from the crowd, and it seems the verdict is in for the King Plus 1000w. In this casewe’ve done complete research, consulted professionals, gathered all the information about it and clarified every single thing about king plus 1000W. And if you still need more, I’ve reviewed King Plus 1200W for you. Each thing mentioned in this one of the best LED grow lights review is a fact. Moreover, based on each point we can’t stop ourselves from recommending King Plus 1000W to you. Just Check its Price here and Go! Go for it. Each penny spent on it is a good investment in the long run. The Galaxyhydro series from Roleadro is designed to create wonder inside any top rated indoor grow tent. Recently I witnessed it working in one of my friends' grow room, and he got a considerable yield during his last grow and is about to start another. Now you may be curious about the technical features of the Galaxyhydro 1000w showcased above. Roleadro 1000W light produces an optimal spectrum which suits the almost any green plant. Well balanced combination of blue, red and white along with UV and IR makes its spectrum like a ray of magic. A reasonable level of PAR ensures that a significant amount of light produced by the panel is absorbable to provide a better yield. Space that can be covered with this magical light is 3’ x 3’ during veg and 2’ X 2’ during flowering. So it's perfect for a small grow, a personal stash, or a beginner who doesn't want to invest much to start. With this spectrum any plant can obtain well-sustained growth with happier and healthier flowers at harvest time. Average power draw by the Roleadro 1000W LED is a mere 135w ±5% which is pretty acceptable. Zener diode keeps your panel safe for the long term. Moreover, the light is equipped with 100pcs 10W Epileds LED chips. The form factor of Roleadro GalaxyHydro 1000W LED Grow Light also has a quality design so that it avoids any light loss during its operational use. Refreshing and well-balanced temperature with the help of cooling fans and the high-quality heat sink is a boon for your next growing adventure. Roleadro says they added extra red lights to attract up to 30%-50% additional cannabis yield. Being a well-known manufacturer Roleadro offers 30 months of regular warranty period. They don’t want you to be worried about its quality. Here are few important pros and cons for the Roleadro GalaxyHydro 1000W. This GalaxyHydro 1000w full spectrum LED grow light was was reviewed highly by hundreds of users. We aren’t allowed to quote directly, but reviewers have commented the bang for your buck aspect, the strong brightness, and good grow results. We fully recommend this grow light. It depends on your exact set up, but it’s definitely a light worth considering. If not then take a look at its advantages and disadvantages again. And then just have a look at its price here.Happy Growing! And here it comes. A highly praised and recommended grow light in the under 100$ segment. It is one of the best 600W LED Grow lights available on the market. Yeah, at this price only a few LEDs in 600W grow light segments are performing up to the mark. This product is designed after years of research and development. Chips implanted in the board are 10W dual chips and create wonder when turned on. Recordcent used dual lens technology to increase PAR by 20%. It also helps in increasing canopy penetration and energy saving. The light produces equivalent to a 600W HPS system while only drawing around 100W from the outlet. Recordcent 600W is an affordable grow light and it won’t break your bank at all. Approximately 2.5’ X 2.8’ of grow space can be covered using this light without any problem. Though, you can increase or decrease its height from the canopy and can experience larger or smaller coverage respectively. A majority of people don’t consider power draw as an essential factor, and that becomes their headache for life. It needs to be considered before buying any LED grow light as we said in our buyer’s guide. It's a recurring cost for the long term so it should definitely be considered. The recordcent 600w produces dual series full spectrum grow light, providing light sufficient for the full cannabis lifecycle. Heat dissipation is great with the help of multiple cooling fans and aluminum heat sink. 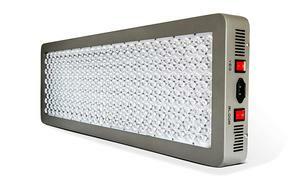 With this grow panel Recordcent is competing with all the big brands on the grow light market. You simply can't beat the price for a 600w light. Not necessarily bad, but if the price were to reflect anywhere it's in the limited warranty. They offer 120 days satisfaction or a refund with this light panel. Take a look at bright and dark sides of this grow panel. It’s a good Kickstarter indeed. Installing it in your grow room will save your money from the very beginning. This is a bear bones grow light for an entry level grow. But we’d definitely recommend it if you aren’t running a complex cannabis grow. Looking at performance and efficiency, we’re recommending Recordcent 600W LED Grow Light to you. Running too tight on budget for your next growing venture? Then worry not. We’re here with one of the best cheap LED grow lights for you. This grow light is doing wonder for many cannabis cultivators. LEDGLE 300W LED is crafted using 50 pcs of epistar 6W LED chips. It is very well engineered to provide the best in the segment output to its users. Moreover, when it spreads its brightness over your plants, you’ll experience its potential with your own eyes. Being an extremely efficient light, it produces a 300W HPS equivalent light and pulls only 100W from your wall socket. It’s a complete full spectrum light suitable for all type of gardening like hydroponic, greenhouse or indoor marijuana growing. More PAR and Lumen output ensure healthier and larger flowers from your weed plants. This grow panel comes with separate bloom and veg mode. So it can be configured for three different modes which makes it easy to use for everyone in your house. Efficient cooling is the identity of LEDGLE 300W grow light and keeps your grow tent as cool as possible and ensures the safety of your plants. A hanging kit is conveniently provided with the grow light to make installation hassle-free. If you’re buying it from Amazon, then don’t forget to check for “Special Offers And Product Promotion” section as many of its existing users have claimed a hefty discount of 50% during checkout. LEDGLE Grow Light At a glance. Have a look on its pros and cons. If you can’t stretch your budget a bit higher and don’t have another option, then going with this grow light would not be a bad move. However, people who are capable of throwing 10-15 bucks extra should look at the 400w version, which would provide you a bit more coverage in case you ever want to add an extra plant. This may be the most admired grow bulb by people with a single or couple of plants. MrHua has crafted this grow bulb very smartly so that users can utilize maximum light for their plants. This grow bulb by MrHua is equipped with 177 pcs of 0.3W LED chips which generate the super bright light spectrum for any marijuana plants. 60 Degree reflectors are there to help your plant in penetrating more light out of it. It’s a lightweight bulb. Elegance and durability aren’t compromised while designing it. This grow bulb is suitable for a 3-4 square foot of grow space. Moreover, it is recommended to people who love to grow individual marijuana plants in their house. Likewise, A circular shape and thin panel design eliminates the need of a cooling fan, and still, it keeps the temperature inside grow space very well balanced. Mrhua 50W Grow Panel comes with two mounting options. Yeah, either you can hang it over your plants as per your requirements, or you can mount it permanently on a fixed distance from the bottom. It comes with 50K hours of lifespan and MrHua offers a 12 month warranty period along with 45 days of satisfaction or return policy. Have a glance over its pros and cons. Lifespan of around 50K hours. Bare bones and lower coverage due to low cost. Is it affordable? Lets be clear, this is one of the best cheap LED grow lights on the market. Is it efficient? Yes. Is it suitable for my single plant? Yes. Should you buy this light? Yes for Mrhua 50W Grow Panel from me as well. Putting the great reviews aside, you just can’t complain if anything goes wrong with this light. It’s too cheap. If you plan to have more than one single cannabis plant I’d advise buying one size larger with a bit more coverage area. This small grow bulb is ruling the LED grow light market like an emperor. Thousands of indoor cannabis cultivators are praising this grow light. The thing is, it's incredibly small. That's not necessarily a negative - it depends on your grow situation. What makes taotronics a trustworthy and a reliable product for the price range is the bare bones but efficient design. For example the 60 degree illumination angle, full spectrum led light, and cool operation. One reviewer writes that this Taotronic LED grow light easily reaches 1300-1800μm. The Taotronics 36W Bulb produces efficient spectrum, this small bulb is equipped with 12 LEDs of different bands like red, blue and white. It generates the right amount of bright light for single plants. The scientifically engineered design ensures the safety of your cannabis plants. The high-quality material is used in its build. Light efficiency isn’t an issue here as it penetrates very dense light over your plant’s canopy and the majority of light can be absorbed quickly by your weed plants or clones. Of course it's a small LED grow light so you'll need to consider if it's right for your situation. A complete photosynthesis process makes your plants to sustain better health throughout its lifecycle. Quality of red light is essential enough to produce resinous flowers and heavy yield. This grow bulb is undoubtedly suitable and most recommended for single plant users. It doesn’t matter whether you want to use it for germination, seedling, vegetation or blooming. Furthermore, installation of this grow bulb hassle-free, and it doesn’t require anything extra. If you're looking for an entry level LED grow light, this is easily one of the best cheap LED grow lights out. Above all, TaoTronics 36W bulb comes with one year of warranty period. However, you’re unlikely to need it. Let me show you its benefits and drawbacks in a brief. Each penny spent on this tiny bulb is a good investment. Yeah, it’s worth its price for sure. Maybe you need to top off your existing coverage for an extra 1-2 cannabis plants instead of buying another huge light. Or perhaps you only plan to grow 1-2 plants in total. Regardless, this would be a good light for you. With that, I’ll surely recommend this TaoTronics 36w full spectrum LED grow bulb to you in case you want to grow a single cannabis plant or any vegetable plant in your grow space. Now, we're presenting you an update buyer's guide that'll give you sneak peak of entire LED Grow Light fundamentals. Then we'll close this guide with our verdict on Best LED Grow Lights on the market. Before we review any of the LED Grow Light, It’s essential to understand why we need it? and what are the factors which we should consider before selecting a good LED Grow Light for your weed plants ? Why Is Best Quality Light Essential For Plants? Plants turn the energy of light into their essential nutrition and building materials with the help of a process called photosynthesis. And they need carbon dioxide and water as well to turn this energy into most essential sugars like glucose. This whole process is the only secret behind well-sustained plants. It’s the base of their lifecycle. Fact is that only sunlight can provide this light, But, there are several artificial grow lights as well which can mimic the real sunlight. Thank to advanced technologies. If you aim to get best possible yield from your marijuana plants, then it’s only possible if you can provide your cannabis plants with best possible full spectrum light. Yeah, because we can’t bring sun inside our house. ? What Are The Different Types of Grow Light Available On The Market? There are several types of light available on the market. Let’s take a brief look at each one. This kind of grow lights are widely known as CFLs, T5s, and T8s. These lighting panels are popular for propagation, vegetative growth and small plants. Different kind of spectrum distribution panels are available, Daylight panels and Bloom panels. The main use of these panels is for two distinct phases of your weed plants. Yeah, Daylight panels are used for vegetation and small weed plants. Bloom panels are used as sidelights during the Flowering phase of your marijuana plants in your Top Notch Best grow tent. You’ll notice this kind of grow light in many of indoor cultivator’s growing space because these light panels are capable of producing highly efficient and extremely intense light indoor. However, it results in extreme heat generation and needs an external cooling mechanism inside your grow space to keep temperature balanced. This panels are also known as HPS panels. These widely known as solar genesis and sulphur plasma. These sort of grow lights are more efficient than HPS, and less depreciation cost is involved in this grow lights. However, this grow light is not suitable for the flowering phase because of several cons attached to it. This is state of the art technology when it comes to indoor growing. Yeah, these panels are best for providing top-notch quality of light to your marijuana plants. Because, The generated spectrum doesn’t produce too much heat and saves plants from usual harm, As this kind of lights provides all the required efficiency and intensity of light. It works for the entire life cycle of any of the plants. On the market of indoor lights, these are the main types of lights which are usually used by professional as well as beginner growers depending on implementation strategy. Usually, LEDs are the most favorable type of lights for professional cultivators, and hence we’d be focusing on LED grow lights for cannabis cultivation in this review and buyer's guide. In this section, we're going to cover the essential question that most of the beginners forget to ask themselves before making the selection. There are several factors which need to be considered before making your final decision to buy an LED grow light for your weed plant. Because, it determines the amount and size of LED Grow Light, you need. If you have a perfect idea of your indoor grow room, then it becomes easy to determine the size and number of panels you need. 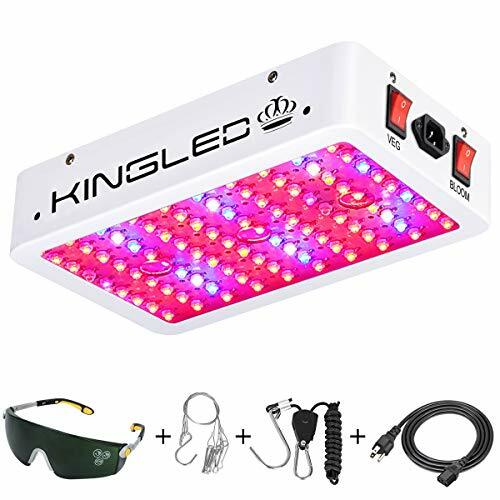 What the general rule of thumb people use for weed plant is that you need a LED Grow Light with 32 watts of actual power draw per square foot. A Professional grower will not look at anything apart from build quality of the grow light. Yeah, excellent build quality means more durability, and that means higher lifespan. If the great quality of LED Chips is used in a grow light panel, then it won’t generate much heat, and it’ll keep your grow space as well as grow light safe from a breakdown. If an LED Grow Light is equipped with a durable outer body, certified LEDs, a good quality heatsink and multiple cooling fans, then you can say it’s good to go product for your grow space. It’s an essential factor to consider because of two reasons. First, Lights which generated extreme heat are less durable. And Second, Minimal heat generation protects your plants from getting damaged. Low heat output ensures safety during flowering phase as during this stage your weed plants would be needed extremely intense light and lesser heat. Yeah, Lumens are the measure of the intensity of any grow light. This measure is for human visibility and not for plants. If you’re growing cannabis indoor then going with higher wattage would be a good choice instead of focusing on lumens. Another most important thing apart from its brightness is colour factors. As a rule of thumb “Red” and “Blue” spectra are ideal for your marijuana plants growth. Wavelength measures this spectra, and that will be specified on the grow light box as well as on user's manual if you in most cases. Generally, “Blue” is most essential during Vegetation while “Red” is essential during Flowering. Rated life of your light is as well an essential factor to consider, because it’ll decide for how long you’re gonna use that particular grow light in your grow room. It’s an excellent way to divide the lifespan of your grow light by the factor of 2 because the actual lifespan would majorly depend on your use. It’s yet another critical factor to keep in mind before browsing through various grow light reviews. There are many premia grow lights are available with comparatively more features than other ordinary grow lights. So, to deal with your budget, there are many budget-friendly grow lights available on the market. It’s the major mistake that many of the growers make initially. LED Grow Light sector is flooded with low-quality manufacturers. So, it’s safe to deal with one who has established themselves as a brand on the market. There are many so-called brands available on the Amazon which are advertising so many features, but in reality, they are not up to the mark. It’s a piece of advice to stay away from such manufacturers. Instead of investing your money in “XYZ Grow Light” it would be a better choice if you spend it in the Advanced Platinum in the long run. After sales support is crucial while buying anything online. Isn’t it? An authentic thing comes with premium and genuine customer support. So, yeah, your purchase should be risk-free. So, yeah, going with an LED Grow light where the manufacturer offers excellent aftersales support and it’s being appreciated by existing users is necessary while making your choice. We know you still have a question your mind that majority of beginners have initially. 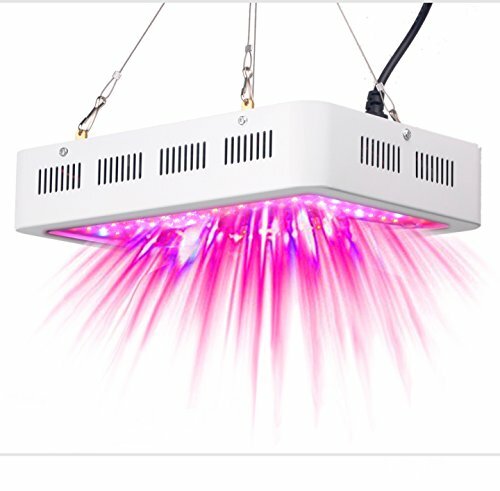 How to Choose The Best LED Grow Light For My Grow Space? Before answering this question of yours, I’d like to ask several questions. Is it your first indoor growing experience? How much grow space you wants to get covered? Do you know current phase of your plants? If Yes, then which is it? What is your primary concern? Budget or Quality and Yield? Yeah, if it’s your first growing experience, then we’d suggest you to start with something small in comparatively smaller space. But, if you’re already familiar with indoor growing, then you should select one which meets your expectation regarding coverage area. Once you find multiple LED Grow Lights you can consider the current phase of your plant's life cycle. If it’s seedling or vegetative, then go with one which either has Blue shade or have purple shade. And for plants in the flowering phase going with Red or Pink light effect would be a good move. Now, you’ll have sorted Grow lights based on your experience, Grow Space, and phase of your plant’s life cycle. Now, go with cheap, and budget-friendly LED if Budget is your primary concern. However, Budget Friendly LEDs can’t provide you with resinous and high-quality yield. Because, generally, this kind of LEDs are built with low-quality light emitting diodes and would not be equipped with the proper cooling mechanism. Eventually, these chips would fail to provide the required intensity of light for your plants. It’s important to note here that there’s nothing wrong to go with budget-friendly grow lights for the shorter run. Now, it’s time to move forward and to take a look at some of the Best LED Grow Lights Available on the market. Before we start, let me throw some light on a few tips to use it for the more extended run and to get maximum out of it. Recommended Ph values for soil is 6.0 ~ 6.5 and in hydro is 5.7 ~ 6.0 in most of the LED Grow lights. Keep the humidity rating between 50-70% in your grow space. Maintain a stable voltage to avoid any hazard or failure. Always wear sunglasses when you get into contact with grow lights. Only a few grow lights with the highest price or state of the art technology will be waterproof, so it’ll be safe to keep your light away from any dripping water. If a grow light can be controlled using a timer then always opt in for a timer to save more electricity. If you have an LED with IR and UV feature and it has an LED which looks exceptionally dim, then it doesn’t mean that LED is faulty. Always keep your grow panel away from hazardous chemicals such as sulfur or acid. Best Recommended distance for any grow light 22-24” during and veg and 18-20” during bloom. However, it varies between manufacturers and light quality. No matter how durable a product is, always give it a couple of hours rest. This is to get the best reliability out of your grow light. Be safe and keep your place safe for your plants. As we all know it becomes tough to select the best grow light when encountered with multiple choices. Even if you can’t buy one of each, take trust in knowing that we’ve already selected the best grow light models for you. You should have a fine experience regardless of your choice! Don’t worry! We’re here to help you out through this confusion. This list comprises almost all type of LED grow lights for almost all the suitable segments. There are premium lights, affordable LED grow lights, small space suitable LEDs as well as huge space suitable LED grow lights available on the market. Now, based on your requirements and plant’s needs we’ll divide the entire list in multiple selectable segments so that you can decide which one suits you best. So, let’s start with Best Budget LED grow light segment first. For the people with small sized grow space there are 3 best choices to opt for that includes following LED grow panel or bulbs. So, folks these are top rated choices available to opt for and you may go for any one that suits your needs. Out of this list you can filter it further based on grow space available to you, or your coverage expectancy and energy efficiency that you can afford in the longer run.